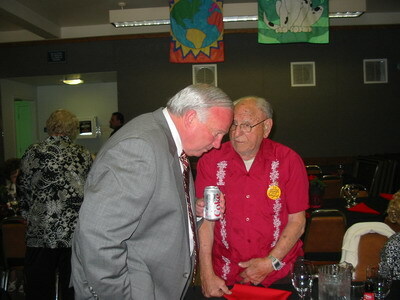 Orlando Vernacchia with Mayor Jerry Sanders at the 2006 Volunteer of the Year Dinner. Longtime Mira Mesa resident and community volunteer Orlando Vernacchia embodied the spirit of “neighbor helping neighbor.” When he died at the age of 92 on January 4, 2010, the entire community of Mira Mesa lost a friend, as well as one of its most active voices. He will be missed. Orlando Vernacchia lived in Mira Mesa for nearly 32 years. He was born in New Jersey on March 17, 1917, and educated there. Orlando and his wife, Roberta, better know as Bobbie, met in the Civil Air Patrol in New Jersey in the late 1960’s. They were married in 1975 and moved to Mira Mesa in 1978. Orlando had lived and worked in San Diego in the aviation industry as a young man in the late 1930’s, before returning to the East Coast. Orlando started work as a machine operator and worked up to a tool and die maker, a shop steward, a research and development consultant, and owner of two corporations, A/C Engine Overhaul and a holding company. In addition to his wife, Bobbie, Orlando is survived by his two sons, Dennis and Robert, from his first marriage, and by his grandson, Robert’s son, Christopher. Dennis Vernacchia lives in Mira Mesa, also. Robert Vernacchia and his wife, Georgie, live in New Jersey. Through the years Orlando was active with a number of Mira Mesa community groups. Orlando was past president of the Golden Friends, a member of the Recreation Council, a Mira Mesa Town Council member and past Town Council Board member, 4th of July Committee member, Community Planning Group general member and past Executive Committee member, Halloween Carnival co-chair, Mira Mesa Maintenance Assessment (formerly Landscape Maintenance) District Committee member, and Mira Mesa Stakeholders Committee member. Orlando was an active member of the Retired Senior Volunteer Patrol (RSVP), citizen volunteers who assist the police. Orlando was a volunteer at Mira Mesa Clean & Green Day for many years. In the past year Orlando was an active participant in the Mira Mesa Planning Group’s Direct Access Ramp Subcommittee meetings, seeking ways to mitigate the impact of additional traffic on Hillery Drive due to the planned DAR ramps to I-15. Orlando Vernacchia also was active with the Civil Air Patrol and Coast Guard Auxiliary in New Jersey and in California. Orlando was a private pilot. He flew from New Jersey to San Diego and back four times, twice solo and twice with his sons. Orlando Vernacchia was honored by the Mira Mesa Town Council as the Mira Mesa Volunteer of the Year in 1989. Speakers at the dinner and “roast” in his honor called Orlando “the angel of the Fourth of July ….but the resident curmudgeon of the Town Council and Landscape Maintenance District Committee,” and “one Town Council member who isn’t afraid to speak his mind….and speak his mind….and speak his mind.” Several speakers described Vernacchia as having a “crusty exterior, but a soft heart of gold.” Orlando was praised, also, for his willingness to help whenever friends or neighbors had something that needed building or fixing. In 2001 Orlando Vernacchia was named the Grand Marshal of Mira Mesa’s 4th of July Parade in recognition of his volunteer activities as a member of the 4th of July Committee. Orlando Vernacchia for years kept up a schedule of volunteering from dawn until after the fireworks on the 4th of July in Mira Mesa, putting up and taking down barricades for the parade, setting up Fun Day booths, manning the 4th of July Committee booth and command center, and in general making sure things went smoothly. Orlando was always there, too, at the annual spring Casino Night fundraiser for the fireworks, not just attending the event but also actively participating as part of the set-up and take-down crew, even well into his eighties. Orlando Vernacchia was a tinkerer and a do-er, someone who enjoyed fixing and building things. He and his son, Dennis, shared the hobby of being amateur (“ham”) radio operators. Orlando’s garage was his home shop where he worked on a variety of projects. Orlando also loved helping his neighbors. Long before the creation of the Mira Mesa volunteer “neighbor helping neighbor” fix-it non-profit group, HEROES, Orlando was a one-man fix-it crew who helped any neighbors in need. On Dec. 26, 2009, a group of Mira Mesa friends joined in a HEROES project to help do some household repairs and maintenance for Orlando and Bobbie, returning in part the favors he’s done so many neighbors over the years. According to those who were there, Orlando was in good spirits that day, chatted, and even gave them some advice. Orlando Vernacchia will be long and fondly remembered.